Pickling paste is used for cleaning stainless steel weld seam heat marks. It is a mixture of hydrofluoric acid (HF) and nitric acid (HNO3) with surfactants and inhibitors. The substance is corrosive, toxic, and irritant. Air respirator and half mask air filter covering nose and mouth are mandatory before handling the pickling paste. This is a case report of a 28-year-old male complaining of sudden onset dyspnea at rest after accidental inhalation of pickling paste fumes. 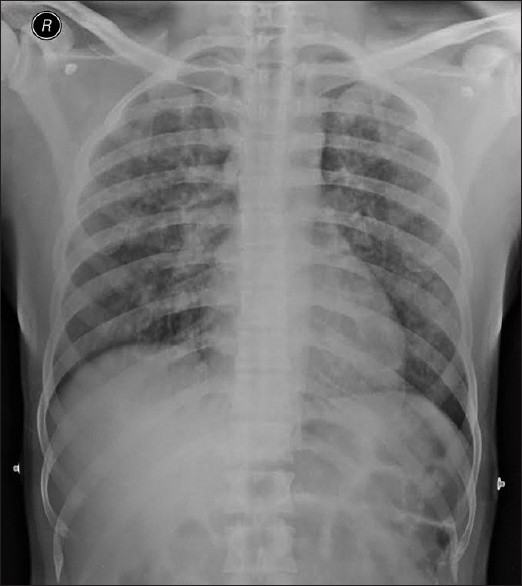 The patient developed acute lung injury and subsequently acute respiratory distress syndrome and was treated with noninvasive ventilation, steroids, and other supportive treatment. There is scarcity of any evidence of case reports on lung injury due to inhalation of pickling paste. Pickling paste is used for cleaning stainless steel weld seams. It is to be applied on the weld seam and surrounding area with a brush. It is a mixture of hydrofluoric acid (HF ~30%) and nitric oxide (HNO3~5%). When pickling paste is heated, nitrous gases develop. The handler of the pickling paste is provided with gas mask, rubber gloves, face shield, goggles, rubber boots, and acid-resistant clothes, prior to using the paste. Pickling paste is a toxic substance. On exposure to skin, eyes, gastrointestinal, or respiratory tract, it is known to cause corrosive burns with yellowish discoloration, blisters, and slow healing wounds, when in contact with skin. When ingested, it causes corrosive burns with burning pain. On contact with eyes, it causes intense pain with risk of irreparable damage. Inhalation of fumes causes cough and difficulty to breathe with a risk of pulmonary edema. 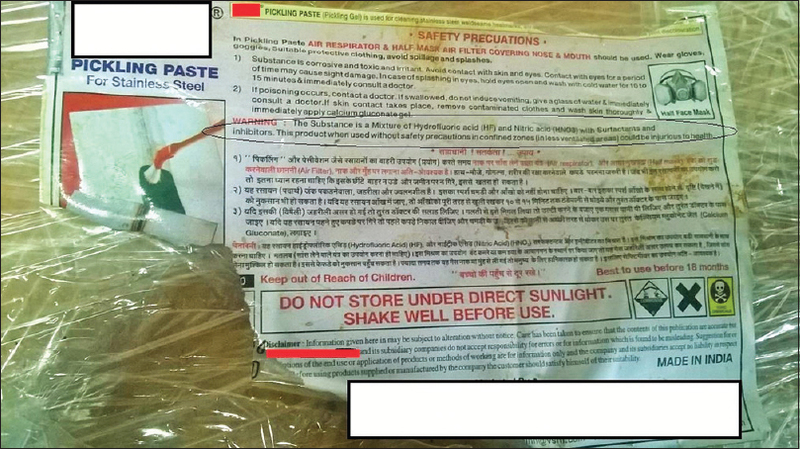 A 28-year-old male worker in a fabrication company reported to casualty with a 1-day history of accidental inhalation of pickling paste [Figure 1] for less than 2 min, despite of using all protective wear. He presented with acute onset breathlessness at rest and cough with expectoration. He denied any history of recent infection, fever, pulmonary tuberculosis, hospitalization, or any comorbidities. He was a nonsmoker and nonalcoholic. On admission he was afebrile, pulse was 96/min, BP was 100/60 mmHg, saturation was 82% at room air. Air entry was bilaterally reduced in the middle and lower zones with bilateral fine crepitations and occasional wheeze. Arterial blood gas analysis showed a PaO2:FiO2 ratio of 178 (pH: 7.38, pCO2: 40, pO2: 60, HCO3: 23.7, SO2: 90% at 4 l of oxygen). Chest X-ray was suggestive of nonhomogenous opacities in bilateral lung fields predominantly in perihilar region, as seen in [Figure 2]. Hemogram was suggestive of leukocytosis with a total leukocyte count (TLC) of 22,620/mm3. Interestingly, on admission, his serum urea was 39 mg/dl and creatinine was 2.13 mg/dl with normal liver function. Serum calcium and electrolytes were within normal limit. Abdominal sonogram did not show any abnormality. Patient was admitted in the Intensive Care Unit and treated as a case of acute respiratory distress syndrome (ARDS) secondary to inhalation of pickling paste. He was given continuous bi-level positive airway pressure mode of noninvasive ventilation (NIV) for first 3 days and weaned subsequently. Inj. methyl prednisolone 500 mg once daily was given for 3 days and antibiotic coverage for 5 days. He was also given two doses of Inj. calcium gluconate 24 h apart. Further, 48 h after admission, the leukocyte count reduced to 18,680/mm3 and serum creatinine levels reduced to 1.09 mg%, although his serum urea was 70 mg/dl. By day 5 of admission, his TLC was 10,150/mm3 and serum urea, creatinine was 69 mg/dl and 0.77 mg%, respectively. Serial arterial blood gases and chest X-rays showed significant improvement. Patient was shifted to ward on day 5 and discharged on 7th day without any residual disability. Pickling paste is a mixture of hydrogen fluoride and nitric oxide, making it a very toxic compound on inhalation. Individual case reports on lung injury due to inhalation of nitric oxide have been reported, and there is scarce evidence of outcomes of exposure to hydrogen fluoride in humans. Inhalation of a wide range of gases and fumes can lead to acute lung injury. Irritant gases when inhaled in high concentrations injure the respiratory tract by causing acute inflammation. More soluble gases exert maximal effect, more proximally in the respiratory tract; and less soluble gases like nitric acid fumes exert maximal effect more distally. Because pickling paste is a mixture of two toxic substances containing more amount of hydrogen fluoride than nitric oxide, this case was treated, keeping in mind, the effects of both. After inhalation of either substances (HF or HNO3), severe pulmonary injury has been reported in the form of pulmonary edema and bronchopneumonia. The ability of hydrogen fluoride (HF) to cause necrosis is due to the toxicity of fluoride ion rather than the hydrogen ion. Highly electronegative fluoride ion penetrates tissues deeply and binds calcium leading to hypocalcemia (and hypomagnesemia), tissue burns (rare), and cell death. Although, we were not able to estimate the amount of pickling paste (fumes) inhaled by the patient. Severe and delayed injury can occur with exposures to dilute (<20%) solutions of HF. With concentrated solutions (>40%) of HF, the effects are more rapid and pronounced with immediate pain and skin damage. Acute toxicity with exposure to HF can manifest, with varying severity, depending on the route of exposure. The patient can present with ocular irritation, diarrhea, cough, wheezing in mild to moderate cases of poisoning. Gastrointestinal burns are expected on ingestion, and may cause hemorrhagic gastritis, and pancreatitis which have been reported after significant exposure. Ingestion or inhalation may cause systemic poisoning with hypocalcemia, ventricular dysrhythmias (prolonged QTc, torsades de pointes), hyperkalemia, hypomagnesemia, acidosis, and cardiac arrest. Cardiac toxicity generally manifests within 6 hours of an exposure. Dyspnea, bronchospasm (with abnormal pulmonary function test and hypoxia), chemical pneumonitis, pulmonary edema (can be hemorrhagic), tracheobronchitis, upper airway obstruction, chemical burns (larynx, trachea, bronchi), ARDS, and respiratory failure may occur following inhalation. Ingestion of more than 30 ml of a 5% solution of HF can be fatal. Treatment of patients with calcium gluconate is indicated as an antidote of HF. Calcium binds the fluoride atoms to avert tissue injury and systemic fluorosis. Nebulized beta agonists for bronchospasm, humidified oxygen, calcium gluconate 2.5 to 5% nebulizer treatment along with supportive care is indicated in acute inhalation of HF. Intravenous calcium is administered if systemic toxicity or hypocalcemia develops. The spectrum of illnesses in nitric acid inhalation injury is variable, and response to severity is unpredictable. Survivors of high-level nitrogen dioxide exposure may experience a biphasic clinical response characterized by acute bronchospasm and laryngospasm, and development of pulmonary edema 8–24 hours later. Patient can also develop bronchiolitis obliterans. Our patient developed moderate ARDS with a PaO2:FiO2 ratio of 178, due to inhalation of mixture of HF and HNO3. He was treated with steroids, NIV along with nebulization with beta agonists and intravenous Inj. calcium gluconate. Hence, this case reports the effects and management of pickling paste exposure in an occupational setting. Crofton and Douglas's respiratory diseases. 5th ed. Occupational lung diseases; p. 1446. Hydrogen Fluoride. Toxicology Data Network. US National Library of Medicine. Available from: (https://vsearch.nlm.nih.gov/vivisimo/cgi-bin/query-meta?v%3afile=viv_725LY2&server=pvlbsrch14&v%3astate=root%7croot&url=https%3a%2f%2ftoxnet.nlm.nih.gov%2fcgi-bin%2fsis%2fsearch%2fa%3fdbs%2bhsdb%3a%40term%2b%40DOCNO%2b546&rid=Ndoc29&v%3aframe=redirect&v%3aredirect-hash=91ad4cf3dac709367ac446a376d041dc&). [Last accessed on 2017 Nov 20]. Pillai LV, Ambike DP, Husainy S, Vishwasrao S, Pataskar S, Kulkarni SD. Severe lung injury following inhalation of nitric acid fumes. Indian J Crit Care Med 2005;9:244-7.